For the families working at the Makgaleng dumping site, “ A better life for all” is a distant dream. 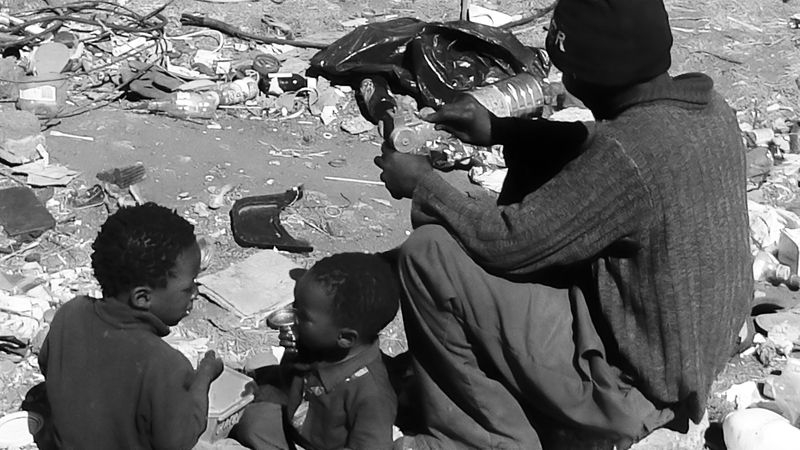 Poverty stricken families spend their time at the dumping site just to get a meal for each day. It is sad to find such poverty next to two of the best performing mines, Sibanye Gold and Harmony South Deep (Joel Mine). Makgaleng is a landfill site situated right next to the water reservoir of Theunusen. It is meters away from the Masilo community, divided by a national road. Makgeleng, ’a place of aloe leaves’ in Sesotho, serves as a landfill site both to the community and businesses of Theunusen. It also serves as a place for refuge to more than 18 families of waste pickers occupying the site. This dumping site has become the birth name of a 2 year old boy whose parents Tahleho and Nomtatso Lekau, have been waste picking for more than 5 years. Mr Lekau decribed his son Paballo ‘Makgaleng’ Lekau’s arrival at at the landfill site. The Lekau family picks plastic and sells it to the regular recycling company from Welkom. “The plastic we pick gives us about R18 a day to R400 per month.” said Mr Lekau. They only have waste picking as a source of income. The entire family do not have any legal documentation that identify them as citizens of this country. “My mother has refused to assist me in finding an identity book after I have lost my birth certificate whilst a teenager. My sister’s boyfriend burnt her suitcase that had my certificate in it during their fight.”, continued Mr Lekau. With this lack of documentation, Mr and Mrs Lekau were not able to find employment and their children cannot receive a support grant from government, hence they are subjected to waste picking. The majority of waste pickers at the site have a similar issue of documentation. On a daily basis, Lekau’s family walks approximately a kilometre from their Lusaka home to Makgaleng to pick waste during the day and return in the evening. “At night, my family occupies a backroom shack of an old woman. I cannot afford to pay any rent so this lady asked me to serve as a guard during the night while she gives my children a place to sleep at night.”, said Mr Lekau with a sad face. All this happened after the municipality threatened to remove all waste picking families who built shacks by the landfill site with a claim that the municipality is going to grant the site to a recycling company. The families had to relocate to Masilo where they are forced to pay rent. They come in the morning to pick and leave in the evening. The Muncipality started to build a fence around the site but they left this unfinished without a fence. This allows people to come and steal at night what is being collected by waste pickers during the day. “We work hard during the day and leave our pickings well packed in the afternoon, only to find them missing in the morning. They removed us from the site , now we can’t look after our pickings” continued Sporo. They are not exposed to only these threats. They also suffer from health hazards caused by air pollution of burning stuff at the site and eating food from the trash. “We sometimes do not have food so we feed ourselves from the food we find left in the plastics.” said Mr Lekau placing a piece of meat from a black plastic on a fire. The look from his son’s eyes is filled with joy as he shared the piece amongst them for lunch. “My children have adopted this lifestyle, they don’t get sick. They have been feeding on this since their infancy”, he concluded. The last threat they are exposed to is a fear of falling into holes in the ground. “As you are busy picking at times, you can feel the vibration of mining machines from underneath. It scares a hell out of children including us adults.” said Mr Lekau. The landfill site is situated between two performing mines, Sibanye Gold Mines and Harmony Deep. Our action as an organisation thus far is that we went to Home Affairs offices in Welkom to ask for a mobile office to visit the site so that the department assists the waste pickers there with finding proper documentation of citizenship. The department refused a special request stating that concerned individuals must be at the community hall where all residents of Masilo receive help at the the scheduled time. We have been consulting waste pickers to prepare necessary documents for the next visit. We want to see all of them properly documented and children receiving a government grant. Secondly, we sent requests for donations to social movements and individuals to help with basic needs such as clothes and food for the children. Lastly, we are of view that the rights of our people must be respected and their lives deserve transformation. We wrote a letter to the municipality stating our concern that it must assist with the crisis at the site and when the recycling company is set up, current waste pickers must be secured employment within that company.